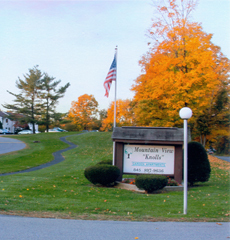 Mountain View Knolls is conveniently located in Southern Dutchess County minutes from major roadways and employers. Mountain View Knolls is a family/owner managed complex situated on ten acres of gently sloping landscaped grounds minutes to all major access routes in the Fishkill area. It is approximately one mile west of the East Fishkill IBM site and within minutes of Interstate 84 and the Taconic State Parkway. It is located at the intersection of routes 52 and 82 with it's driveway coming off route 82, and opposite the Brinkerhoff Elementary School. We offer a variety of studio apartments, and spacious one, two and three bedroom apartments and flexible leasing terms to fit your needs. Our phone is covered twenty four hours and the management staff live on site. Mountain View Knolls is located in the Wappingers Central School District, one of the finest systems in Dutchess County. The Brinkerhoff Elementary School is directly across the street with bus service provided. Van Wyck Junior High School and John Jay High School are also nearby. Amenities include ample parking facilities, storage areas, a laundry room open 24 hours, children's play area, basketball court, barbeque/picnic area. We are pets friendly and offer a designated dog walk area. Business hours are Monday through Friday from 10:00am until 5:00pm, Saturday from 11:00am until 4:00pm and Sundays and evenings by appointment.